Istanbul (AFP) - Turkish police on Sunday arrested the editor of Turkey's biggest-selling newspaper and 26 others in lightning raids on supporters of a US-based cleric who has become President Recep Tayyip Erdogan's top foe. The operation was the most significant yet against supporters of Fethullah Gulen, an influential former ally of Erdogan whom the Turkish strongman accuses of running a parallel state from abroad. At least 27 people were detained in raids across Turkey, including Ekrem Dumanli, the editor-in-chief of the Zaman daily newspaper which is closely linked to Gulen. Those held include an executive of Samanyolu television, also seen as close to Gulen, as well as a TV director, producers, scriptwriters and some police officers. Arrest warrants were issued for a total of 31 people, the official Anatolia news agency reported. Anatolia said detainees were accused of a number of offences including "using intimidation and threats" to "form a gang to try and seize state sovereignty", "forgery" and "slander." The European Union condemned the police action, saying it went "against the European values" that Turkey aspires to as it seeks membership in the bloc. In a statement, foreign policy chief Federica Mogherini and enlargement commissioner Johannes Hahn said the raids were "incompatible with the freedom of media, which is a core principle of democracy." US State Department spokeswoman Jen Psaki said Washington was "closely following" the developments. "As Turkey's friend and ally, we urge the Turkish authorities to ensure their actions do not violate these core values and Turkey's own democratic foundations." 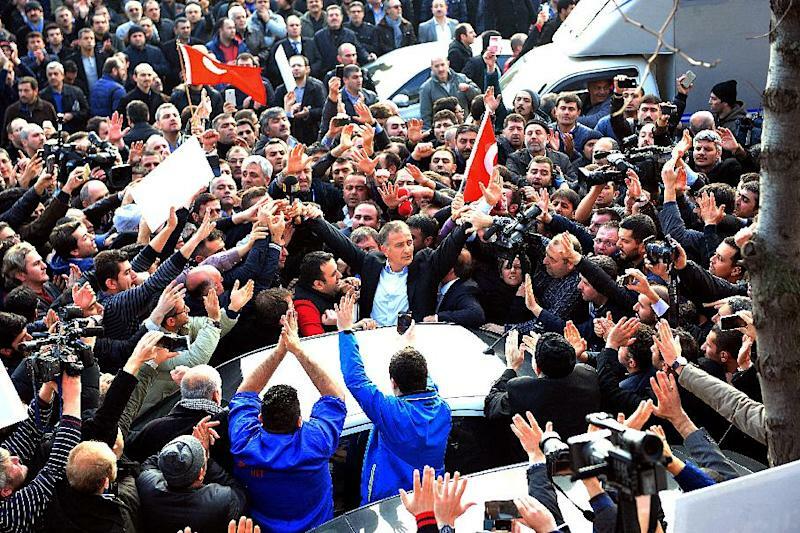 Clearly expecting the arrest of Dumanli, some 2,000 supporters and journalists gathered outside Zaman's offices on the outskirts of Istanbul, preventing police from entering. But plain clothes officers returned a few hours later, detaining a defiant Dumanli, who was applauded as a hero as he was led away through the dense and angry crowd. Amid dramatic scenes broadcast live on Turkish television, the crowd chanted slogans such as "The free press cannot be silenced" and "Turkey is proud of you." "Let those who have committed a crime be scared. We are not scared," Dumanli said. The corruption probe, opened on December 17, 2013, saw the arrests of dozens of leading businessmen and political figures close to Erdogan, who was prime minister at the time. The president, accused by critics of becoming increasingly authoritarian, managed to stall the investigation by sacking thousands of police and scores of judges and pushing through laws tightening state control over the judiciary and the Internet. Erdogan warned Friday of a new blow against the "evil forces" of Gulen and said he would "pursue them (Gulen supporters) in their lairs". "Whoever is beside them and behind them, we will bring down this network and bring it to account." 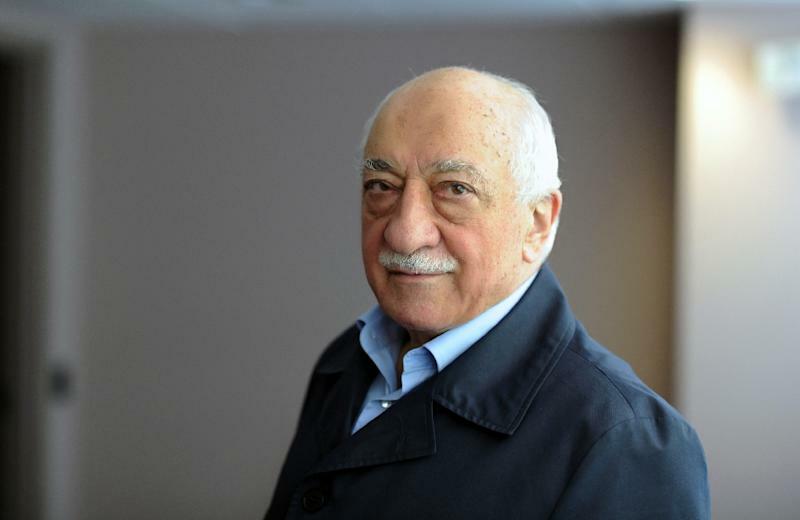 Pennsylvania-based Gulen, 73, is the spiritual leader of the powerful Hizmet (Service) movement, which controls media outlets, schools and cultural centres. He was a key backer of Erdogan before falling out with him over the government's plans to shut down his schools. Hidayet Karaca, the head of Samanyolu TV, called the raids "a shameful sight for Turkey", before he himself was detained. "Sadly in 21st century Turkey, this is the treatment a media group with tens of television and radio stations, Internet media and magazines receives." As in almost all previous raids -- which targeted mostly police officers suspected of backing Gulen -- the details of the swoop were leaked by a mysterious Twitter user named Fuat Avni before it was even carried out. Last week Fuat Avni, believed to be a government official, warned his followers that police were set to detain some 400 people, including 150 journalists. Late Saturday, he went on to publish the names of those journalists, some of whom were among those rounded up. Leader of the main opposition Republican People's Party (CHP) Kemal Kilicdaroglu denounced the operation as "a coup" that "we cannot accept under any circumstances". "The process that we are going through is not something faced in healthy democracies. This is a coup process," he told reporters, vowing to be on the side of the victims. But Prime Minister Ahmet Davutoglu accused the Gulen movement of trying to seize control of "the bureaucracy". "Today is a day of test. Everyone will pay for what they have done and their anti-democratic behaviour," he said. Human Rights Watch Turkey researcher Emma Sinclair-Webb wrote on Twitter that the detentions look "like another attempt to crack down on critical media."